Falkirk slumped to a second cup exit in a week as First Division St Johnstone ran out convincing winners. The visitors drew first blood against the Scottish Premier League outfit when Martin Hardie headed home his seventh goal of the season. Saints captain Kevin James doubled their advantage with a fine header from a Paul Sheerin corner. The Perth men took control after the break and Peter MacDonald added a third to kill off the tie. Both sides made some changes of personnel after their respective CIS Cup semi-final exits in midweek. Falkirk defender Cedric Uras had returned to France for the birth of his son, while Vitor Lima and Liam Criag were dropped to the bench. Marc Twaddle replaced Uras, while Steven Thomson and Stephen O'Donnell took ovcer from Lima and Craig in the home midfield. Saints manager Owen Coyle had Willie McLaren available again after suspension, but the wide man had to settle for a place on the bench. The only other change from the side which ran Hibs close in midweek was Steven Anderson, who replaced the suspended Allan McManus. Russell Latapy had the first effort on goal from 12-yards, before a neat one-two between Latapy and Alan Gow led to the striker flashing a shot wide. Martin Hardie and Derek McInnes both volleyed over from distance as St Johnstone looked to get into the match. Saints were now in full flow and they took the lead when Martin Hardie headed home from six yards after a Paul Sheerin corner was flicked on by Kevin James. The visitors doubled their lead when former Falkirk defender James headed into the corner of the net from another Sheerin corner. Both sides passed up chances as an open, entertaining first half drew to a close. 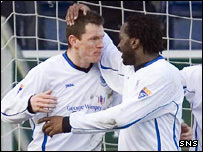 St Johnstone came close at the start of the second period when James headed over from close range after a Paul Sheerin effort from six yards was blocked by Darren Barr. Peter MacDonald then hit a left-foot volley from twelve yards out, but Falkirk keeper Kasper Schmeichel saved well. Hardie was next to go close with a volley from the six-yard box from another Sheerin corner as the visitors took control of the match. Sheerin's set pieces were causing Falkirk problems, and James went close again as Schmeichel tipped over another volleyed effort. MacDonald made the pressure count as he added a third, driving the ball into the net from close range from a Hardie pass. Falkirk finally seemed to wake up, and both Latapy and Patrick Cregg rifled in volleys which were saved by Saints keeper Kevin Cuthbert. It was a case of too little too late for the Bairns, however, as Saints contained their pressure and ran down the clock for a well-deserved victory. Falkirk: Schmeichel, Ross (Holden 45), Twaddle, Barr, Milne, Latapy, Cregg, Thomson, O'Donnell (Moutinho 64), Gow, Finnigan. Subs Not Used: Lambers, Lima, Craig. St Johnstone: Cuthbert, Lawrie, Stanic (Dyer 68), James, Anderson, Mensing, Hardie, McInnes, Sheerin, Scotland (McLaren 88), MacDonald (Jackson 90). Subs Not Used: Halliwell, Morais. Goals: Hardie 27, James 38, MacDonald 69.